Whew, it's been a busy few weeks! Work and writing deadlines and a slew of events have kept me on the go. Here's a quick look at what I've been up to. A new print edition, a new name: Two weeks ago, Vancouver Fashion eZine presented its third annual print collectible with a fun launch party at JC Studios for advertisers, well-wishers, and anyone who had been involved with the magazine. I spent most of my evening chatting with these great people: Yves Gauthier, Jenny's fiance; Jenny Yen, one half of the Two of Hearts design duo; Fiona Louie, jewelry designer behind Filou and L'arbre Love; Jim, Fiona's husband; and the boy, whom I actually managed to drag out to an event me. Tabitha Savoie, the other half of Two of Hearts, posing for a photo with Jenny. Co-founders Marilyn Wilson and the rather more elusive Renat Toichev said a few words before they presented awards and raffle prizes. The evening was also punctuated by fashion shows. Since September 2011 marked my last month as a contributor at Vancouver Fashion eZine, Marilyn presented me with a book of my own tearsheets as a parting gift: 20 articles over almost 3 years. Such a sweet gift. From the local to the international: Some of Vancouver's most stylish ventured to Metropolis At Metrotown last week to celebrate the opening of the vast new H&M store there. Plenty of happy shoppers enjoyed a 20% discount (and stocked up on fall clothes) as well as a bright, clean, well laid-out store space. 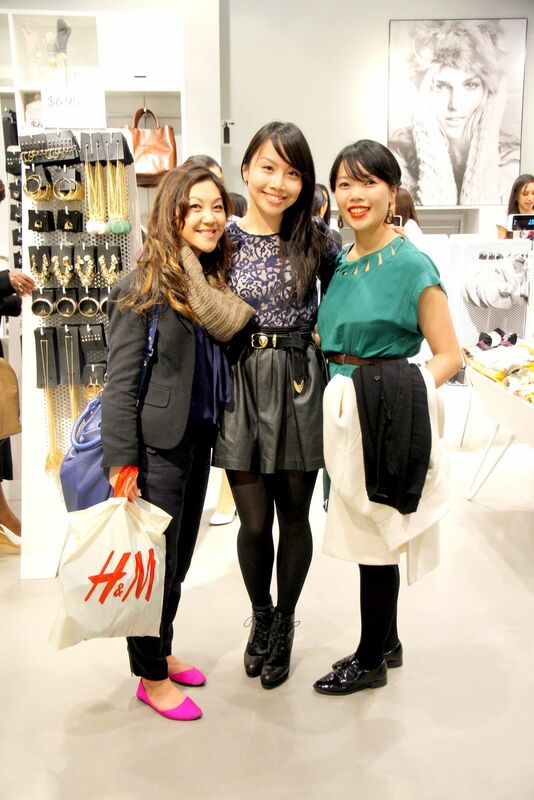 Here I am with Nicole of Le Mode Du Jour and Jen of Her Waise Choice. (Note that Jen is wearing the same blue lace H&M top I wore to the Vancouver Fashion eZine party and featured in this blog post.) The photo is from Jen's Facebook page, which you should definitely check out if you're curious what the store looks like. Or better yet, just drop by and shop. 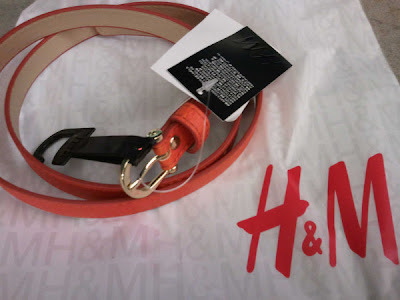 My one purchase from that evening: an orange skinny belt with a gold buckle. Last night, I was also at Birks to celebrate the launch of a fine jewelry collaboration between the Steve Nash Foundation and Roberto Coin. The capsule collection of 18 karat gold and diamond jewelry (priced at $420-3400) features earrings, pendants and even cufflinks shaped like hoops and basketballs. 40% of the proceeds go to the Steve Nash Foundation, a charity which assists underprivileged children. "Hoops have always been a big part of my life in Canada, and to now have this line with Birks--such a big part of the Canadian landscape--feels very integrated into my Foundation's platforms here at home," Nash said of the collection. I loved the sense of fun and elegance in the basketball shape: even if you don't recognize it for what it is, it's just a lovely geometric design. My favourite pieces in the collection are the white gold and diamond basketball cufflinks. Of course, the evening wasn't complete without a photo op with Steve Nash himself! He was very kind and down-to-earth. AND great seeing you at the Bay! I was at the H&M opening as well but it seems that I missed catching you! I was feeling pretty shy that night though...I felt too awkward to go up and introduce myself to people. Congrats on so many articles! That's such a sweet parting gift. Funny: I saw Steve Nash at JJ Bean the other day, and I thought he looked familiar. Duh, because he's Steve Nash! Such a great post Lisa! I've been sad to be missing all the events due to school but you, Monika, and several others have done such an amazing job of tweeting and posting that it almost feels like I'm there...almost :). Love what you wore to the H&M event, so chic as per usual.